For the the second time since it began construction, the Global Innovation Exchange building’s completion date has been delayed. 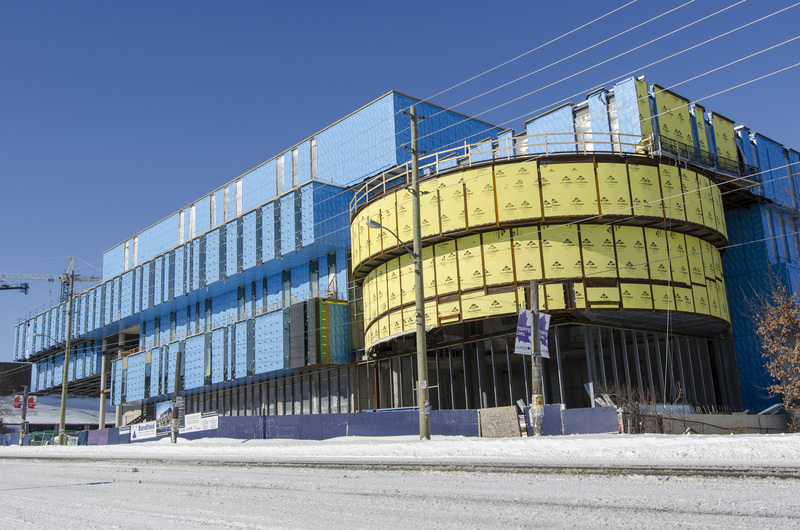 Wilfrid Laurier University students will have to wait another year after extreme winter conditions pushed the GIE building’s schedule potentially back to January 2016. The building was originally set to be completed by May 2015, then was pushed to September 2015 before the latest delay. “We had originally wanted to be in there for the fall term, [but] that’s not going to be possible unless we really sacrifice quality, which we’re not willing to do,” said Mark Dettweiler, director of planning, design and construction at Laurier’s physical resources department. Dettweiler explained while the main reason for the delay was the weather, other issues were involved with the contractor, Bondfield Construction. Laurier’s contract with Bondfield says workers have to maintain the same rate of production through harsh winter conditions that you would experience in a normal Canadian winter. Dettweiler said the biggest issue at the moment is a skylight in the middle of the building that cannot be completed until signs of spring emerge. “We just haven’t been able to make any progress on it, so we have this huge hole in the middle of our building that’s opened to the weather. So that’s kind of then impacted other things,” he said. According to Dettweiler, Laurier chose to sacrifice their short time schedule in order to maintain low costs and high quality. Shane Lawrence, a third-year business student, said he wishes the GIE building could have been completed for its expected due date, and noted that business students don’t have a lot of space to study. “It’s frustrating that Laurier continues to grow the program and take more and more students with nowhere for us to go. There is never any space to study — everywhere is always packed,” he said. Despite having no confirmed completion date, Dettweiler said the university hopes to get professors teaching in the GIE building by January 2016.